Out of the money we raise or are given in sponsorship, about 10% goes into administration which includes the following: Costs Robinah’s salary, Ugandan bank charges, transport fees for visits to the children, wifi access and writing materials. We have been totally blessed this year with the provision of a substantial office space at the Kumi PAG church for Seeds to run from. The church do not charge us for this precious facility despite the fact that they are so short of space themselves for their own staff and projects. This office allows for Robinah to store vital essentials that she takes to to the children and to have meetings with families etc. Robinah will travel anything up to a 2 hour radius to go to visit the children both in their homes and their schools. She meets with the teachers and parents/guardians in all cases at least once every school term. From the UK side Mission Direct are our umbrella charity, which is an incredible blessing, as they supervise all of our money transactions and help us with charity protocols, which gives us credibility and support. They also absorb all of our costs with any of our money transactions, so all money raised goes direct to Kumi – isn’t that good to know? The other 90% goes to pay for healthcare, accommodation, education, food and clean water. 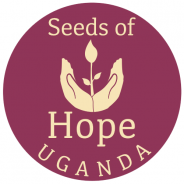 We hope that you can see how hard we are working to ensure that every penny that you donate goes to into the Seeds of Hope directly impacts the children we support.